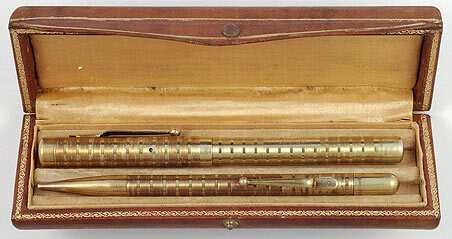 13670: Mabie Todd dip pen: sterling silver, 16.2 cm long, fully marked, unusual six-lobed form with alternating panels of smooth and scroll-chased pattern; ex-Tefft collection. 13673: Mabie Todd dip pen: sterling silver, 16.1 cm long, fully marked, high quality scroll pattern, crisp with blank cartouche; ex-Tefft collection. 12117: Mabie Todd Longshort Stylo: black chased hard rubber vest-pocket eyedropper-filler, 7.8 cm closed, 11.45 cm open; made in England, fully functional, spring-loaded needle intact, even wear including to metal tip, but functionally sound, imprints with patent numbers. 13826: Mabie Todd Swan: gold filled lever-filler, 12.95 cm long, New York production, crisp engine turning, section overlay fully intact, trace brassing on posting end, initials "L.B.B." engraved on barrel; #2 nib is responsive with somewhat scant tipping, good paper feel. 12029: Mabie Todd lever-filler: unusual black chased hard rubber model made for retail by Pittsburgh's Singer Pen & Gift Shop, known for having ordered a number of special models from Mabie Todd over the years; 13.3 cm long, nickel plated trim, plain clip, flat feed with #2 economy-line "M.T & Co." nib. Crisp and unfaded, nib is a little draggy if used at a steeper angle. 12112: Mabie Todd Longshort Stylo: black chased hard rubber vest-pocket eyedropper-filler, 7.3 cm closed, 11.3 cm open; made in England, fully functional, spring-loaded needle intact, imprints strong, hard rubber unfaded. 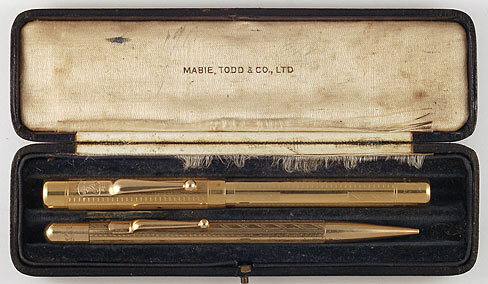 11940: Mabie Todd Swan set in box: black hard rubber lever-filler with engine turned gold filled overlay, 13.2 cm long, New York production, with matching Fyne Poynt pencil; both would be near mint, but the pencil has a couple of scratches and bumps to the eraser cover and the pen has the typical corrosion damage to the section overlay (see details). Still a very handsome set, top quality construction and weight, pencil uses 1.1 mm lead, pen is a smooth writer. 12963: Mabie Todd Swan 44 Eternal: black veined pearl lever-filler, 13.7 cm long, gold filled trim, excellent color, sharp imprints, big #4 Eternal nib; scarce short-lived semistreamlined model, New York production. Name lightly imprinted on barrel, nicks to front of lever opening, usual pitting to lever plating (see details); almost invisible axial stress mark from nib vent hole, should be stable given thickness and firmness of nib.